A cortège that you will never forget. This is how one can sum up the ceremony of the Washing of Bonfim, a celebration that perfectly demonstrates the interaction between Roman Catholicism and the Brazilian religion of Candomblé, which are so strongly present in Salvador, capital of the Brazilian State of Bahia. The Washing of Bonfim consists, essentially, of the day when 200 Bahian women in traditional attire was the stairs of the Bonfim Church, which is one of the most sacred institutions of the Roman Catholic Church in Brazil. However, the date is much more than this. There are some 200 women in all, that take into their hands a vase full of scented water, or água de cheiro – a mixture of scented leaves with water – and brooms since 1773, and walk a total of 8 kilometres (5 miles) from the Church of Our Lady of the Conception of the Beach to the Bonfim Church, climbing the Holy Hill. They are accompanied by a procession of followers, onlookers, tourists and even politicians who are on a political campaign, in a symbolic act of faith that takes place every year. It all started in a way that was far from poetic. At the end of the 18th Century, slaves were required to wash the stairs of the Bonfim Church, to prepare the venue for the Catholic festivities that would soon follow. However, like nearly everything that was forced upon the African slaves in Brazil, what was originally a form of punishment and an obligation was soon transformed into something beautiful and which was poetically incorporated into Brazilian popular culture. This marked the appearance of the feast of the Waters of Oxalá, the Candomblé god who was hidden under the figure of the Lord of Bonfim in this particular case, as the African slaves were not allowed to follow their own religion. And, for that very reason, they all wear white, which is the colour associated to Oxalá. 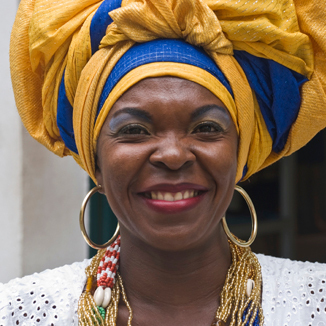 While they wash the stairs and the atrium of the church, the Bahian women sing traditional hymns and are always accompanied by the sound of the atabaques, or Afro-Brazilian drums. The event always happens on Thursdays, and is followed by a popular party with stalls and typical food, on the streets of the Lower City. There is also a big musical show at the Museum of Rhythm starting at 2 p.m., led by Bahian artist Carlinhos Brown, and also other profane festivities scattered throughout the region. The programme consists of the start of the procession at 8 a.m., with the procession getting to the Bonfim church at noon. 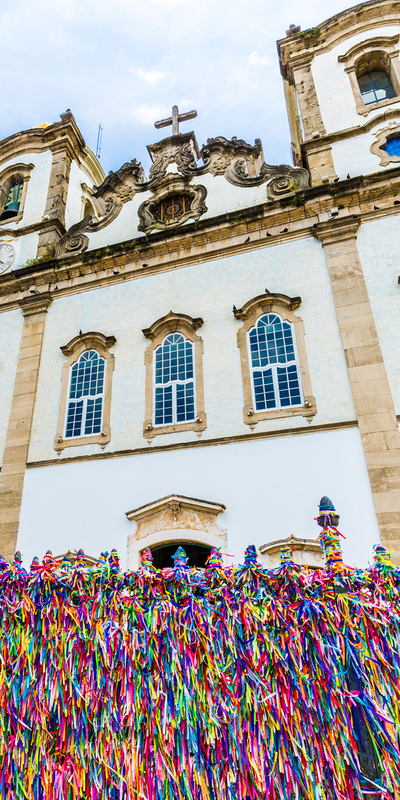 In the meantime, at the Bonfim Church, the show of religious songs starts early, at 9 a.m. During the Washing period, the Church doors remain closed.